Strut & Fret Production House’s Fun House begins with Uuve Jansson (an artist with Cirque du Soleil) performing aerial acrobatics on a high trapeze to entertain the audience queuing outside the Vagabond tent in the Garden of Unearthly Delights. The show is billed as a family-friendly affair, and the performers are a talented group, appearing in costuming both colourful and imaginative. Some of the humour is slightly adult, but there is the usual children’s theatre participation, with the audience encouraged to call out, respond and sing along. Inside the Fun House, which will set up in the Garden of Unearthly Delights. In between circus acts, the performers dance energetically as they mime to various songs, and it is refreshing to have one artist suspended in a heart and singing live as she accompanies herself on a ukulele. A very sweet and gentle umbrella dance duet including juggling umbrellas is also a delight. Another highlight is the incredibly skillful hula-hoops routine and, while overall the show is enjoyable and entertaining, we would have liked a few more exceptional moments like this. Occasionally a screen is used to display videos while performers are on stage, but instead of complementing the action, it seems to distract from it. 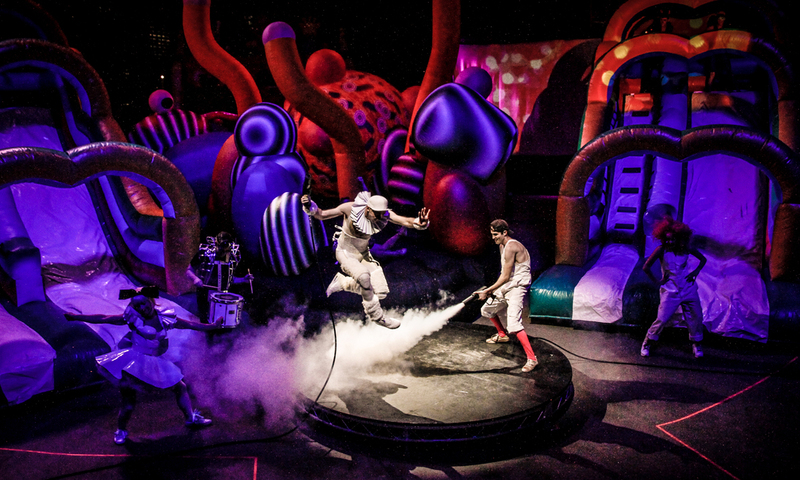 The show cleverly builds to the inflating of a large bouncy house that fills the tent around the stage, but this isn’t then used to enhance the fun – it is just, tantalisingly, there. Overall, Fun House is indeed fun, and is performed by a talented, entertaining troupe who dance slickly and smoothly move from act to act. A quirky, interesting introduction to circus, song and burlesque, interspersed with horsing around and comedy. Fun House is being presented by Strut & Fret Production House in the Vagabond tent at the Garden of Unearthly Delights until March 18. Read more InDaily Fringe reviews and stories here.